The Alexander Hamilton U.S. Custom House is the home of the New York branch of the National Museum of the American Indian. A must-see if you're in downtown NY, and as part of the Smithsonian, it's free! Really interesting exhibits and the building itself it totally gorgeous, both inside and out. 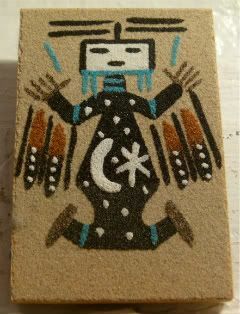 I picked up this magnet - a Navajo sand art painting magnet with Father Sky depicted. From what I've learned, sand art paintings are used in holy ceremonies where Earth people and Holy people come together. In fact, the Navajo destroy their sand art upon completion, releasing the spirits into the wind (I assume). Kinda freaked me out that I had not only kept one of these paintings, but that it's in the form of a magnet! But, the site I linked to earlier mentions that the Navajo fear having the correct version of any of their holy people in just anyone's hands. So, these pieces, and any of the ones found available for commercial sale, have important mistakes on them, so that they're not accurate depictions of the real thing. Whew. When I learned that, it sort of made me feel a lot better, because I also felt just a little oooky having bought a magnet of one of entire culture's holy figures. Of course, now that I've read up on this stuff, next time I'm back home, I'm totally heading back to the museum to go see if Mother Earth is there on sale, because now it's freaking me out, not having a complete set. Every image I've seen of Father Sky, he's usually standing right beside Mother Earth. Maybe he's lonely. Maybe it's the reason for the last year of insanity. Maybe if I right the balance, things will go swimmingly. What? I know I'm not Navajo, but whatever you believe in, don't go tempting the fates of someone else's culture or beliefs. I learned that the hard way - having left my ATM card in an ATM, after kindasorta mocking the creepy music and the creepy guy following us around the Joseph Smith birthplace we just had to visit in Vermont.